By Aidan Coyle | February 22, 2018. 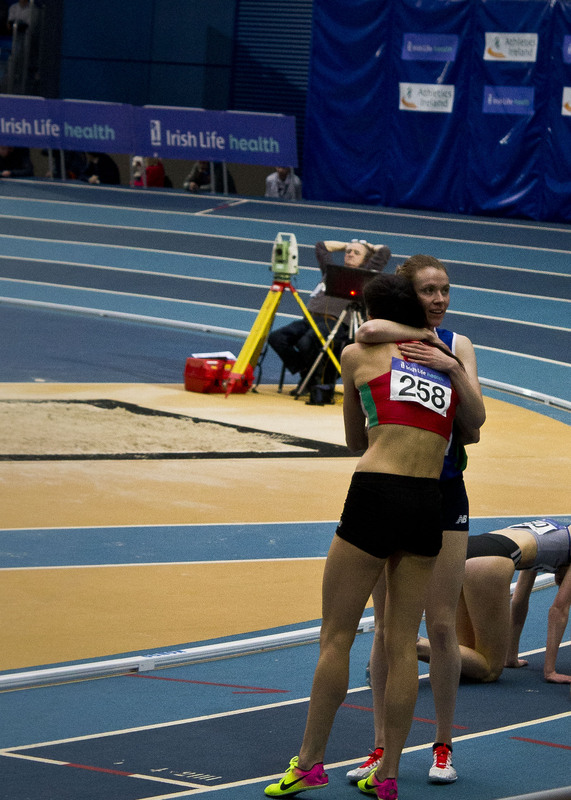 There were a number of star performers at the Irish Indoor Athletics Championships on the 17th and 18th of February. Amy Foster won in style as she broke the national 60m record with a time of 7:27. However, there was disappointment for second placed Joan Healy who was one hundredth of a second outside the World Indoor Championships qualifying time. Joan’s sister Phil was dominant in the 400m. She has been in electric form this season and she cruised to victory in 53:10. Catherine McManus has also been in good form this year and she finished second in 53:81. 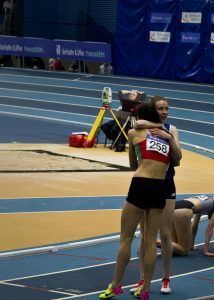 Sarah Healy (17) broke the national youth (under 18) and junior (under 20) records to win gold in the 3,000m. Her time of 9:10.43 was enough to see off the challenge for steeplechase specialist Kerry O’Flaherty who finished second. Long distance runner Emma Mitchell showed her versatility as she was victorious over the shorter 1,500m. There were also victories for Niamh Whelan in the 200m, Alanna Lally in the 800m, Kate Veale in the 3000m race walk and Elizabeth Morland in the 60m hurdles. Off the track Ellen McCarthy broke the national junior pole vault record with a clearance of 3.72m to take victory. Sommer Lecky continued her sparkling form as she easily won the high jump with a best of 1.84m. Michaela Walsh won the shot put and the horizontal jump titles went to Sarah McCarthy in the long and Sarah Buggy in the triple. On the men’s side Matthew Behan was a surprise winner in the 60m hurdles. He broke his personal best to beat favourite Ben Reynolds in a time of 7:84. Leon Reid also impressed as he completed the sprint double. He won the 60m and 200m in times of 6.72 and 21.36 respectively. There were also wins for Andrew Mellon in the 400m, Mark English in the 800m, Kieran Kelly in the 1,500m, John Travers in the 3,000m and Alex Wright in the 5,000 race walk. Sean Breathnach broke his own national record to take the shot put victory with a throw of 18.30m. Adam McMullen broke his pb in the long jump. His final effort of 7.99m was also a cruel 1cm off the national record. Barry Pender won the high jump with a majestic clearance of 2.24m. The triple jump title went to Anthony Daffurn and Matthew Keenan Callinan won the pole vault.